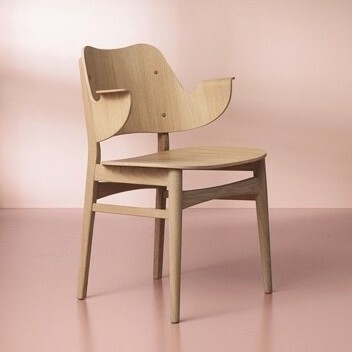 Gesture chair, designed in the 1957 by Hans Olsen is part of the classic collection of furniture by Danish Brand Warm Nordic. Made from a solid oak frame with moulded plywood seat and back. Its arm rests invite you to sit down and relax and gives the chair its unique gesture. This upholstered chair is availabe in various fabric wood finishes depending on look you are after. While is designed as a dining chair it is equally well suited as an occasional chair in a bedroom or even in the office.